In its first year, 'Purrsian Blue' forms a small, perfectly rounded, densely branched clump of tiny, green leaves. In year two, the plant maintains its compact mounding habit but nearly doubles its spread to just over two feet across. This is a very floriferous selection whose flower power is amplified by its having its flowers spaced closely together on the stems. Periwinkle blue flowers are coddled by dark purple calyxes just above the aromatic foliage from early summer into early fall. 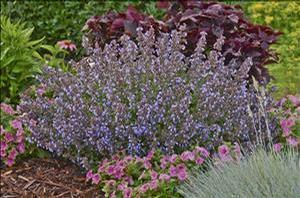 'Purrisan Blue' has everything today's gardeners are looking for: a low maintenance, drought tolerant, deer resistant, long blooming perennial that looks great all season. 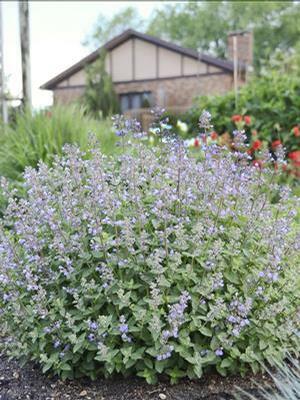 When Nepeta's stems are broken, they release an aroma into the air that tends to attract cats, thus its common name, Catmint. Shear after first flowering to promote additional bloom. Photo courtesy Walters Gardens Inc.
© Copyright 2019 National Nursery Products, Saint Louis, MO 314-966-0253 | Produced by Clarity Connect, Inc.